Himberg (Hinberg) Anderson was born July 4, 1864 in Harstad, Norway. He married Simmonitte Signe (Sena) Christoferson in 1870. 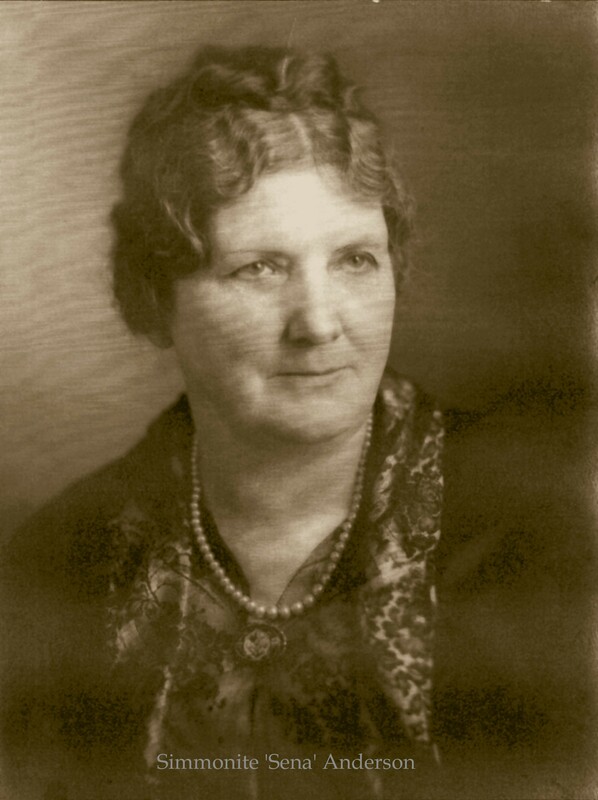 Sena was born 26 October 1870 in Oslo, Norway. They immigrated to the United States in 1893 and were naturalized in 1896. 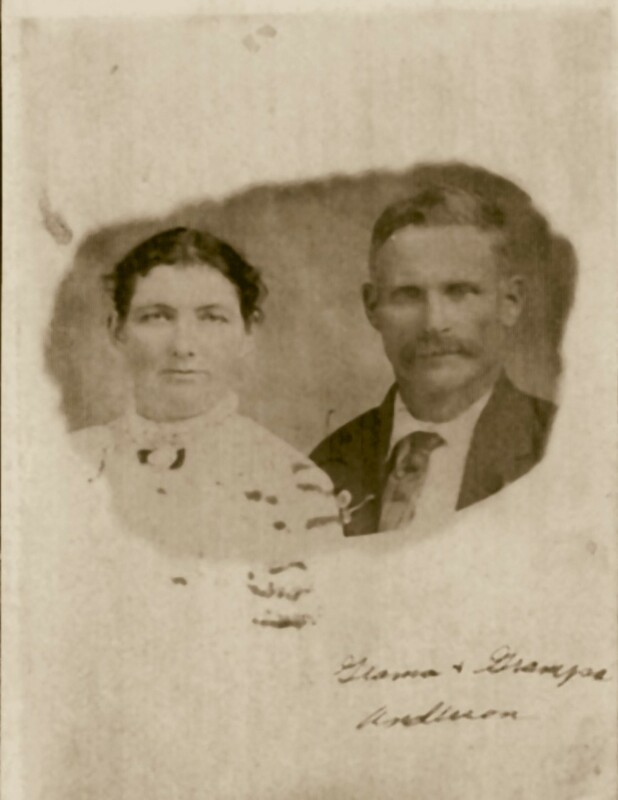 Himberg, Sena and their first child Adolf who was born in Norway settled in Buce, Wisconsin, a small town in the west-central part of the state in Rusk County. 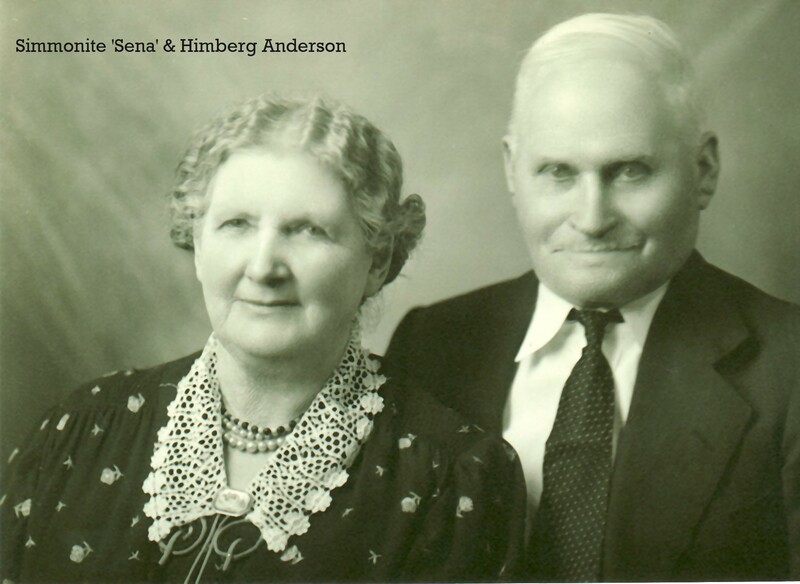 Sena and Himberg had 9 children, 8 living to adulthood. Adolf 1891-1977 age 86; Clarence 1893-1979 age 86; Harry 1896-1972 age 76; Jureen (Jack) 1897-1982 age 85; Helmer 1899-1962 age 63; Signe Helmena born 03 September 1902 (Jerry’s mother) died 23 August 1950 age 48; Stafford 1905-1991 age 86; Birt born before 1910 but did not survive; Arnold 1910-1962 age 52, all born in Bruce, Wisconsin. According to Stafford Anderson’s autobiography notes, the family farmed and Sena ran a restaurant in Bruce, Wisconsin. To support the farm the sons were not drafted to serve in World War I. The 1920 census shows Sena and Himberg in St. Paul, Ramsey County, Minnesota. Himberg was employed by the Federal Government in the prison system. One census classifies him as custodian. The 1930 census shows Sena and Himberg in St. Paul, Minnesota and I have not found them in the 1940 census yet. 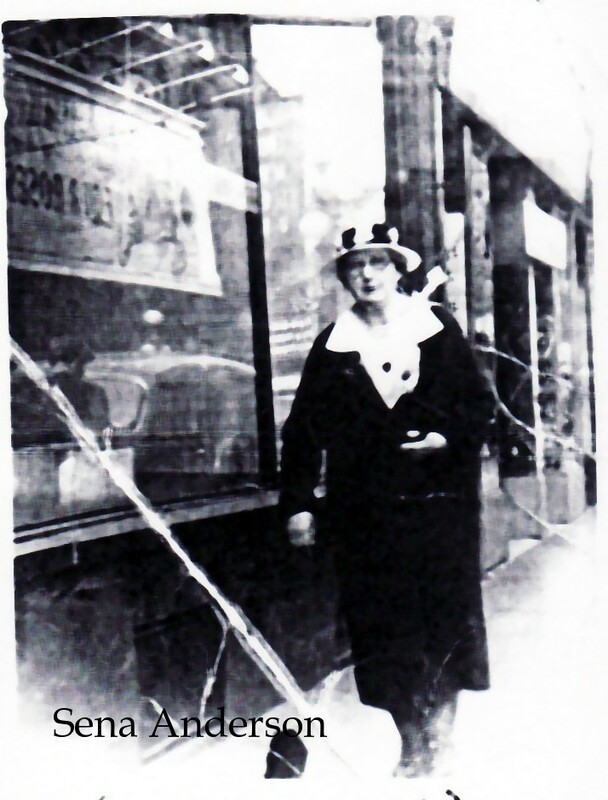 After Sena’s death in 1945, Himberg moved to Springfield, Missouri to be near his daughter Signe. 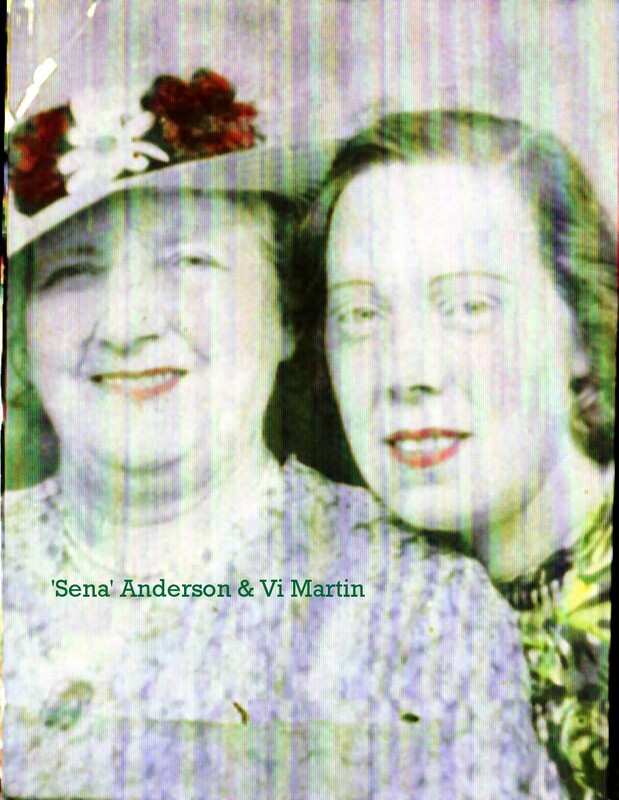 Sena Anderson and Viola Martin. I don’t exactly know the relationship between Viola Martin and Sena Anderson yet, however references by the Anderson children to Viola and Frank Martin are aunt and uncle. Seated inside the car is Himberg Anderson. 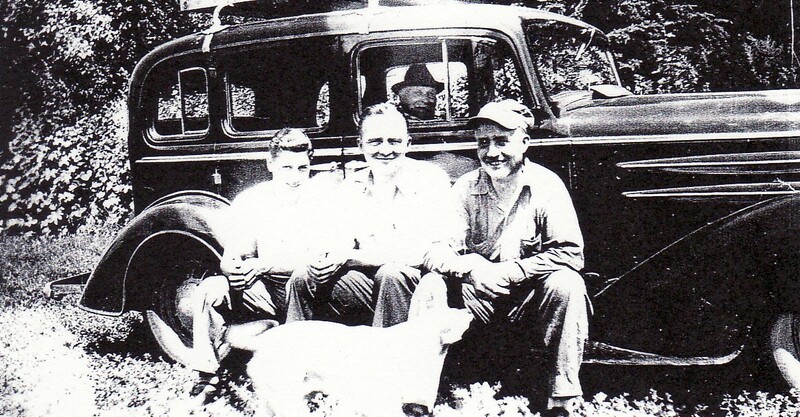 Left to right in front of car is Jerry Stalter, Clarence Frahm (Jerry’s step-father) and Frank Martin. Through the web site Find A Grave, I made contact with a gentleman who sent me pictures of the headstones for Sena and Himberg who are buried in Acacia Park Cemetery in St. Paul, Minnesota. The birth year for Himberg is not correct on the headstone and I don’t know why Sena has a middle initial of ‘D’. More puzzles to solve! More stories and pictures on the Anderson children to come, stay tuned! 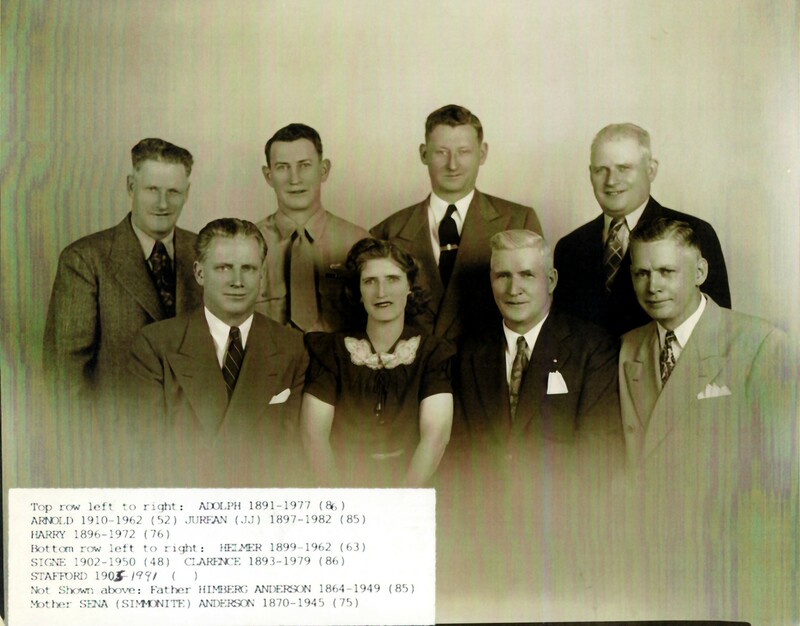 This entry was posted in Family History and tagged Adolf Anderson, Anderson, Arnold Anderson, Bruce Rusk County Wisconsin, Clarence Anderson, genealogy, Harry Anderson, Helmer Anderson Signe Anderson, Himberg Anderson, Jack Anderson, Jureen Anderson, Norwegian family history, Sena Anderson, Signe Frahm, Signe Stalter, Springfield Missouri, St. Paul Minnesota, Stafford Anderson, Stalter.